With much talk in the press recently about hat safety standards we are here to dispel the myths around the EN1384 standard. EN1384 standard hats ARE still a perfectly safe hat to use and protect you. If you do not compete in any competitions and your hat meets the EN1384 standard you do not need to purchase a new hat with the PAS015 or SNELL standard. This is because you do not have to comply with competition rules so will not be affected by any changes by riding organisations. EN1384 hats will continue to be as protective as they have been for the best part of 20 Years, since the standard first appeared. You can still continue to wear your EN1384 hat and even purchase a new replacement EN1384. 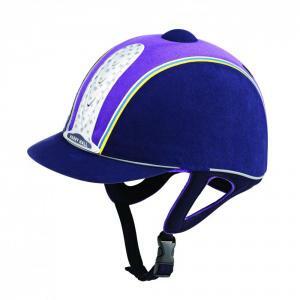 The major benefit to EN1384 hats over PAS015 and SNELL is that they tend to be slimmer in profile, more lightweight and often more ventilated than other hats and also more cost effective so you can continue to enjoy the protection and comfort these hats provide – especially on a long summer hack. On average most people replace their hats every 2 years, which, given the gravity of the job that your hat does and the amount of wear and tear on it, is quite a small investment in keeping your head as safe as possible.